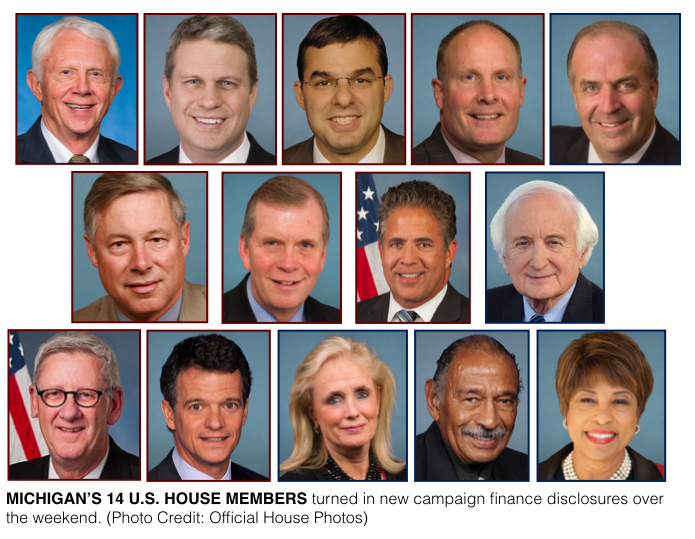 LANSING — The average U.S. House member from Michigan raised $1.3 million for 2016’s election. With the 2018 version still 15 months away, some of the contenders are already on their way to that number. Over the weekend, candidates who’ve been raising money to run for the U.S. House next year had to turn in disclosures on their fundraising for the July quarter, which ran from April 1 through June 30. Michigan candidates who turned in reports combined to raise about $2.8 million over the 90-day period. The 14 incumbent lawmakers raised about $2.3 million of the total. Of the $2.8 million, Michigan's U.S. House candidates raised, about half of it, $1.4 million, from political committees, such as political action committees (PACs), not individuals. The top Michigan fundraisers for the July quarter were two incumbents: Rep. Fred Upton, a Republican from St. Joseph; and Rep. Bill Huizenga, a Republican from Zeeland. Upton, who represents the 6th District and was first elected to the House in 1986, reported raising $360,342 for the quarter. Upton has been floated as a potential candidate to run against U.S. Sen. Debbie Stabenow, a Democrat from Lansing, in 2018. Although Upton led Michigan House members in fundraising for the period, he didn’t raise as much as he did over the same period in 2015, when he raised $537,130. Huizenga, who represents the 2nd District, reported raising $331,596 during the July quarter of 2017. Behind him was Democrat Haley Stevens, from Rochester Hills, a candidate running in the 11th District in 2018. Stevens, who served as chief of staff for former President Barack Obama’s Auto Task Force, reported raising $323,039 during the quarter. Her campaign launched in late April. Rep. David Trott, a Republican from Birmingham, currently represents the 11th District. He reported raising $154,126 during the quarter. But Trott reported $284,191 cash on hand at the end of the quarter. 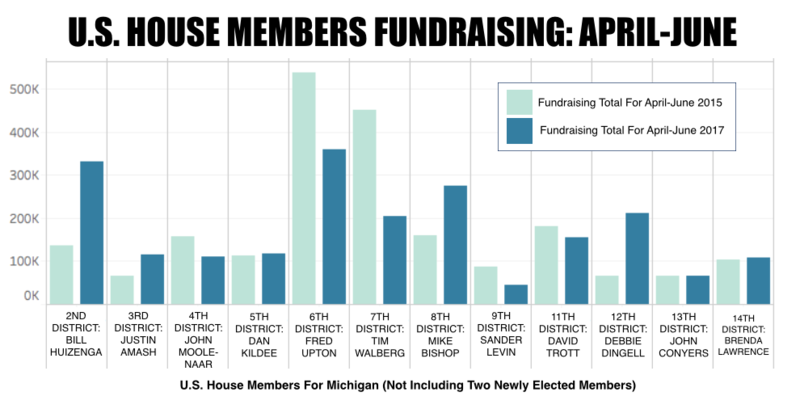 The following is a summary of Michigan’s 14 U.S. House members’ fundraising totals for the July quarter. A comprehensive summary of the new campaign finance disclosures for incumbents and candidates is available at this link. The full campaign finance reports are available through the Federal Election Commission. 1st District, Rep. Jack Bergman, a Republican from Watersmeet: Raised $161,731 during the quarter; raised $320,420 for the election cycle; reported raising $257,834 from political committees for the cycle; and reported $89,616 cash on hand at the end of the quarter. 2nd District, Rep. Bill Huizenga, a Republican from Zeeland: Raised $331,596 during the quarter; raised $563,429 for the election cycle; reported raising $446,636 from political committees for the cycle; and reported $453,180 cash on hand at the end of the quarter. 3rd District, Rep. Justin Amash, a Republican from Cascade Twp. : Raised $114,667 during the quarter; raised $152,458 for the election cycle; reported raising $15,750 from political committees for the cycle; and reported $207,209 cash on hand at the end of the quarter. 4th District, Rep. John Moolenaar, a Republican from Midland: Raised $111,120 during the quarter; raised $162,611 for the election cycle; reported raising $104,590 from political committees for the cycle; and reported $93,699 cash on hand at the end of the quarter. 5th District, Rep. Dan Kildee, a Democrat from Flint: Raised $116,987 during the quarter; raised $330,224 for the election cycle; reported raising $192,850 from political committees for the cycle; and reported $600,216 cash on hand at the end of the quarter. 6th District, Rep. Fred Upton, a Republican from St. Joseph: Raised $360,342 during the quarter; raised $614,116 for the election cycle; reported raising $396,600 from political committees for the cycle; and reported $771,709 cash on hand at the end of the quarter. 7th District, Rep. Tim Walberg, a Republican from Tipton: Raised $204,097 during the quarter, raised $405,027 for the election cycle; reported raising $192,250 from political committees for the cycle; and reported $387,452 cash on hand at the end of the quarter. 8th District, Rep. Mike Bishop, a Republican from Rochester: Raised $275,625 during the quarter; raised $431,953 for the election cycle; reported raising $310,997 from political committees for the cycle; and reported $393,947 cash on hand at the end of the quarter. 9th District, Rep. Sander Levin, a Democrat form Royal Oak: Raised $44,570 during the quarter; raised $84,931 for the election cycle; reported raising $71,250 from political committees for the cycle; and reported $202,200 cash on hand at the end of the quarter. 10th District, Rep. Paul Mitchell, a Republican from Dryden: Raised $101,373 during the quarter; raised $184,951 for the election cycle; reported raising $107,000 from political committees for the cycle; and reported $112,430 cash on hand at the end of the quarter. 11th District, Rep. David Trott, a Republican from Birmingham: Raised $154,126 during the quarter; raised $358,128 for the election cycle; reported raising $161,699 from political committees for the cycle; and reported $284,191 cash on hand at the end of the quarter. 12th District, Rep. Debbie Dingell, a Democrat from Dearborn: Raised $210,464 during the quarter; raised $264,894 for the election cycle; reported raising $120,500 from political committees for the cycle; and reported $421,021 cash on hand at the end of the quarter. 13th District, Rep. John Conyers, a Democrat from Detroit: Raised $64,736 during the quarter; raised $129,710 for the election cycle; reported raising $99,000 from political committees for the cycle; and reported $30,116 cash on hand at the end of the quarter. 14th District, Rep. Brenda Lawrence, a Democrat from Southfield: Raised $107,774 during the quarter; raised $169,181 for the election cycle; reported raising $134,166 from political committees for the cycle; and reported $245,061 cash on hand at the end of the quarter.